Before Leopard was officially released, one of its most anticipated features was Spaces, Apple’s take on virtual desktops. Using Spaces, you can set up different workspaces, each with its own programs, windows, and documents, and then switch between those workspaces. Unfortunately, Spaces has also been one of Leopard’s biggest disappointments—for some people, at least. It’s not that Spaces doesn’t work well; it does. But it’s got enough quirks that it’s turned off a good number of power users, and it’s missing many little features and touches that would make it appealing to more people. Addressing some of the latter ommissions is the goal of Tony Arnold’s Hyperspaces, currently in public preview (meaning it’s not quite finished, but you can download it and take it for a spin; the final version will be $13). I’ve been using Hyperspaces a bit, and while it’s still a work in progress, I’m impressed with the progress so far. Choose a different Desktop image or color background for each workspace; this makes it easier to tell, at a glance, which workspace you’re currently using (or which one you want to switch to). Name each space, and have that name displayed on the Desktop—yet another useful visual cue. You can even choose the font, color, and size, as well as the onscreen location, for the text label. Choose to display the current workspace’s name in the menu bar in addition to, or instead of, Spaces' standard menu-bar icon. 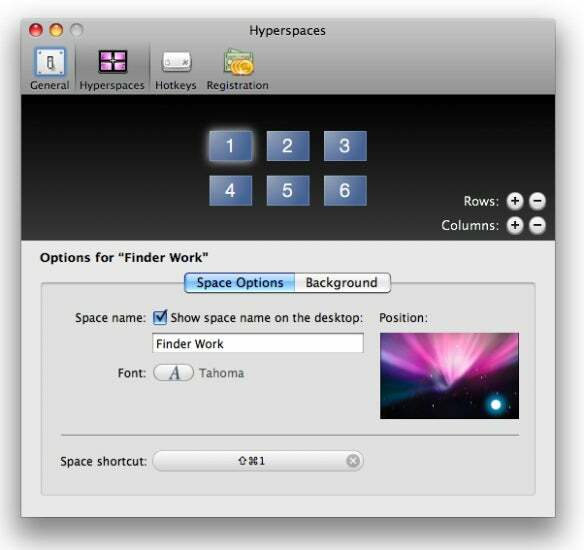 Use Hyperspaces' own workspace switcher. Instead of taking over the entire screen, Exposé-style, Hyperspaces' switcher drops down from the menu bar and shows the Desktop background and name of each workspace—again, making it easier to choose the desired workspace. Assign custom keyboard shortcuts for viewing the Spaces switcher; for directly switching to each space; for adding and removing rows and columns of workspaces on the fly; and for cycling between workspaces. Unfortunately, Hyperspaces doesn’t do anything to fix some of the more annoying Spaces behaviors (such as how frustrating it can be to work with the same application in multiple spaces). But for making quick switches and adjustments to your Spaces configuration, and for making it easier to identify different workspaces, Hyperspaces looks like a promising prospect.